As a substitute Quizmaster, I try to do my due diligence. I check past recaps to see how many teams a bar usually has in an average week. But with a whopping 13 teams, the night before a national holiday is, apparently, anything but average! In the end, it was Diggle Bicks who pulled out ahead of the competition with 63 total points! They managed to barely beat out Team Plutonium, who finished second with 62 points. Both teams scored successful 20-point doubles in the final few rounds. In third was Zach Attack with 55 points, the only other team (among many attempts) to achieve the elusive Round 5 double. Well done, all teams! A shout out also to Camel Tow Truck, winner of free beer for their picture of the 4th of July, creatively drawn and with a hefty helping of local flavor (pictured above). Happy Independence Day, Grunions! It only took team We're Fine, Everything's Fine about 100 tries, but they nailed their first quiz night victory! Congrats to a great team! 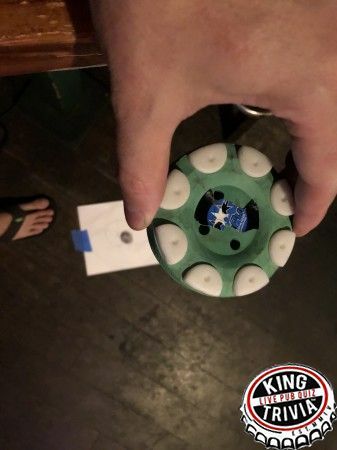 Tonight's bonus round was brought to you by team Know Worries who returned to Grunions after a lengthy vacation. 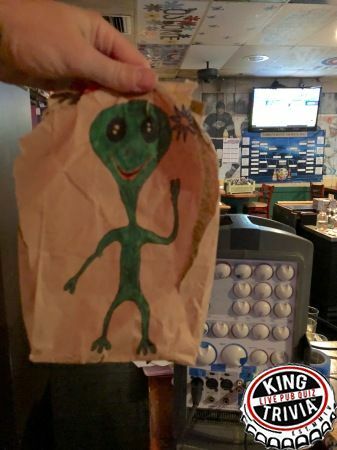 During their travels, they picked up a "Mystery Gift" in Indianapolis with an Alien on a brown paper bag. This gave instant inspiration to have our teams guess what's in the bag! Great job Diggle Bicks who came the closest by guessing "alien guts" when it actually contained salt water taffy. The Diggle Bicks proved once again they were the top dogs at Grunions, but this time it was through their unsuspecting expertise in Richard Nixon. "I did a book report on him in 3rd grade!" You never know what useless knowledge will stick with you and lead to trivia greatness. The Stanley Cup Playoffs may be over, but we still pulled off a special hockey themed physical challenge for our bonus round. No, we didn't shoot pucks at targets or anything like that. It was a faceoff competition to see who could most accurately drop a roller hockey puck from table high down to a target below. It turned out to be harder than it looks! Next time you're at a hockey game, make sure to give the linesmen a hand.